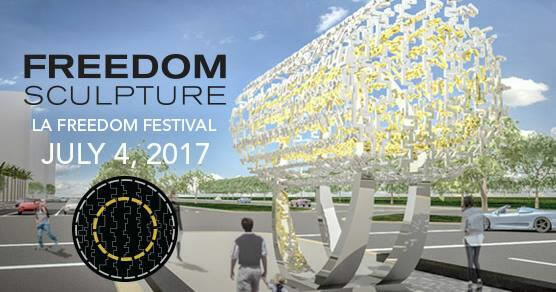 The Freedom Sculpture will be unveiled and officially gifted in a free public ceremony at the culmination of the inaugural L.A. Freedom Festival, which will take place on Tuesday July 4, 2017 from 5:30pm to 10:00pm at a street closed section of Santa Monica Blvd. and Avenue of the Stars. In addition to the unveiling, the L.A Freedom Festival will be a celebration of diversity and unity in Los Angeles, featuring amazing multi-ethnic foods, diverse musical acts, and a grand fireworks finale! EBI & ARASH will perform in this event. MC: MAX AMINI. Santa Monica Blvd & Century Park East, Los Angeles. L.A. Freedom Festival is free and open to all.